What’s the one thing plaguing people with bikes? They get stolen! Hello, remember the movie “Pee-Wee’s Big Adventure”? Yeah, that movie. Bikes are a hot commodity, easy to steal, and even better — you can sell them pretty darn quickly if you’re that cunning of a thief. So, needless to say, if a criminal sees your bike, you better have a way to lock it up tight like Fort Knox, or your investment’s good as gone. You’re not only branded and setting up promotional marketing — you’re offering an even better value to a customer purchasing a bike. Be creative. Set it up as a special offer. Get the word out. Buy a bike, get a free spiral cable lock. Makes for a great way to get some visibility and interest going. 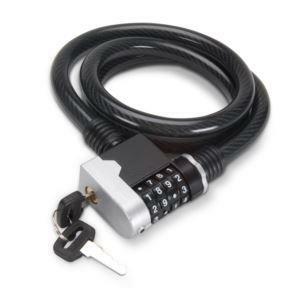 The point of a spiral cable lock is that it’s a bit easier than one of those numerical locks, which people can often forget what their combinations are. A simple key-and-lock system offers something safer and simpler without losing the added security. You park your bike, you unlock the cable, hook it up, fasten it, and no one will ever try and steal your commodity right from under your nose. It’s a win-win (and a lose-lose for thieves out there). Or better yet…. Bringing in a bike for repair! Get a free spiral cable lock. Come again. Customers remember just how much value you provided on top of repairing that bike, or selling you a hot item. Goes miles and miles. All you need to do is check us out at BRAVA Marketing for the designs we have in spiral cable lock promotional gifts. Contact us when you find something you like. And don’t forget to lock up that bike.